Fox News host and man-on-the-street interview specialist Jesse Watters decided to turn his segment toward the traditional Christian holiday of Easter. Starting with Good Friday and ending with Easter Sunday, this holiday revolves around the death and resurrection of Jesus Christ — the Easter Bunny had nothing to do with it. Don’t tell that to these people, though. They wouldn’t have a clue. So Watters decided to set out and see just how much these non-religious folks knew about Easter. He started in the heart of Manhattan to figure it out. See the “Watters’ World” segment below, and try not to roll your eyes too hard; they might stay that way. The segment, which appeared on “The O’Reilly Factor” in 2016, showed that these average Americans don’t know jack when it comes to Easter. This is really a national cultural travesty. Many people didn’t even know what holiday was coming that Sunday. Do you think the history of Easter should be taught in school? Some had no idea what the holiday signified. 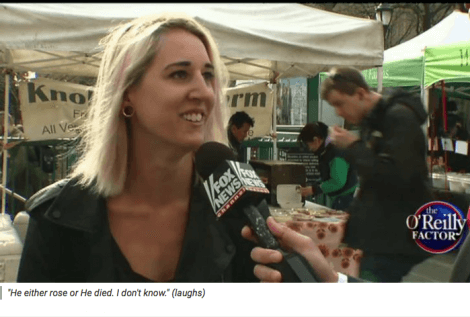 “Why do you celebrate Easter?” Watters asked one woman. “Because that’s when Jesus Christ was born,” she responded. While many in schools are forced to learn about other faiths in “World Religion” courses, it appears that little attention is being placed on the importance of learning the faith of most of the Founding Fathers. The very religion that this wonderful country was founded upon is completely underrepresented in the government-controlled public education system. I don’t even want to hear what people think Christmas is all about.